We have not even got over discussing the future of collapsible wheels, and are face to face with this full functional commuter that even betters the collapsible wheel. Dubbed the Bike Pack, this unique bike can be rolled up into a back pack, making it an ideal choice for youngsters who like portability. The concept is a part of the design thesis for the designer, and to say that it would make it to the factory in the near future isn’t wrong for the sheer flexibility it brings to the bicycle. Bicycles are a popular medium of commuting across the globe. Keeping in mind its importance, designers need to think on the lines of a bike that makes cycling a pleasure. Such themed products could indeed change the way the world thinks and we do need a green contribution from everyone. 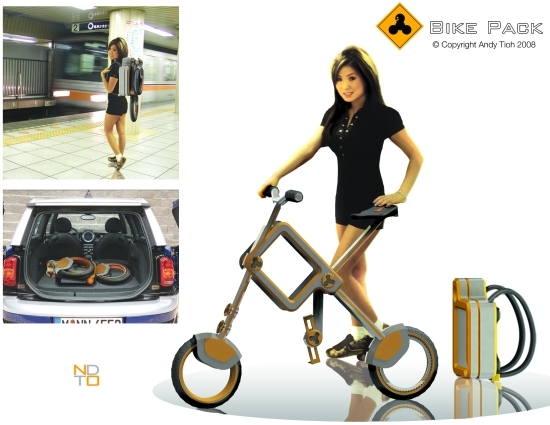 Andy Tioh, the designer of this bike pack is the man for the future. Sadly, this talented designer is yet to find a taker for his project but looking at his talent, we hope that he soon gets his due!